Fold exterior mirrors into the body electrically . Switch on the exterior mirror heating. Heats only at ambient temperatures below +20°C (+68°F). Set the left exterior mirror to the front, rear, right or left by moving the rotary knob. Set the right exterior mirror to the front, rear, right or left by moving the rotary knob. Neutral position. Exterior mirrors are folded out, exterior window heating is switched off. It is not possible to adjust the exterior mirrors. Select synchronised adjustment of the exterior mirrors using the button and the and Mirrors and wipers function buttons in the infotainment system . Turn the rotary knob to the L position. Adjust the left-hand exterior mirror. The right-hand exterior mirror will be adjusted at the same time (synchronised). If necessary, correct the settings for the right-hand mirror by moving the rotary knob to the R position. The automatic anti-dazzle exterior mirror is controlled together with the automatic anti-dazzle interior mirror . Select a valid vehicle key for saving the settings. Unlock the vehicle using this key. Put the gearbox into neutral. 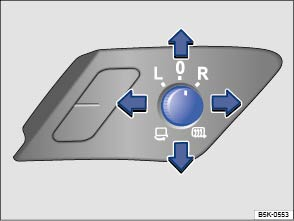 Activate the reverse gear exterior mirror lowering function using the button and the and Mirrors and wipers function buttons in the infotainment system . Adjust the exterior mirror on the front passenger side so that you have a good view of the kerb area. The settings for the mirror position will be saved automatically and assigned to the vehicle key that is used to unlock the vehicle. Turn the rotary knob for the exterior mirrors to position R.
With the ignition switched on, select reverse gear. The front passenger exterior mirror will move out of the position saved for reversing when the vehicle is driven forwards faster than approximately 15 km/h (9 mph) or when the rotary knob is moved out of position R into another position. Injuries can be sustained if you do not take care when folding the exterior mirrors in and out. Only fold the exterior mirrors in or out when there is nobody in the path of the mirror. Always ensure that no fingers are caught between the exterior mirror and the foot of the mirror when the exterior mirror is moved. Incorrectly estimating the distance from vehicles travelling behind you can cause accidents and serious injuries. Curved mirrors (convex or aspheric) enlarge the field of vision and can make objects in the mirror seem smaller and further away than they actually are. Using curved mirrors to estimate the distance of other vehicles when changing lanes is inaccurate and can cause accidents and severe injuries. Whenever possible, use the interior mirror to check the exact distance away from vehicles behind or other objects. Ensure that you have a good view to the rear of the vehicle. Always fold in exterior mirrors before using an automatic car wash.
Do not fold electrically folding exterior mirrors in or out mechanically by hand as this can damage the electric motor. The exterior mirror heating should be switched off when it is no longer needed. Otherwise fuel will be wasted. Initially, the exterior mirror heating will heat at maximum temperature. After approximately two minutes, the temperature will be adjusted according to the ambient temperature. If there is a fault, the electric exterior mirrors can be adjusted by hand by pressing on the outside of the mirror.